All our Colts teams are run by volunteers, with practice nights on Fridays from 6pm. Parents are welcome to stay and enjoy a drink in the bar while watching. Top effort by the U12s today in the Graham Harris Cup, losing in the final over to North Devon. But for an ill-timed tummy bug rendering one of our players sick at the last minute leaving us with 10 men, we might well have beaten them. Losing the toss, we were put into bat and after an early setback losing Ben Seaman for just 3, brothers James and Julian Hayter put on 57 in 9 overs for the second wicket before Julian was unluckily bowled by a double bouncer for 9. When James had to retire on 28* (with 4 fours) Jim Keates (7) and Dan Smith (5*) helped take the score to a competitive 94-7 off our 20 overs. Our batsmen had no answer to Will Popham’s left arm over bowling, taking 5-7! 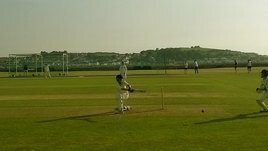 After the break our bowlers bowled steadily but couldn’t get a breakthrough – both North Devon openers retiring on 25*. Evan Suggett (1-15 off 4 overs) continued the good work of Julian (4 overs for just 7 runs) showing there is real potential for this team, and James Hayter passed the keeper’s gloves over to Ben to chip in with 1-4 off 2. A decent fielding performance with a couple of missed run-out opportunities, something we have to work on. Overall a good effort against a strong North Devon side, and with an 11th fielder on the pitch we might have done them! Bideford hosted Filleigh in their latest under 12 league encounter on a showery Sunday morning (28th July). Losing the toss, Bideford openers Olly Hannam (33 rtd) and Matt Parkhouse (13) found themselves facing the new ball. A great partnership pushed the run rate along at over five an over for the first 10 overs before Matt was unlucky to fall to a great catch which brought Karne Elphick to the crease. Karne played some super shots in good partnerships with Olly and then Rose against some tidy Filleigh bowling. A late flurry of wickets was inevitable as Bideford strove to post a healthy total with both Will Lamana and James Seaman striking the ball well in the final overs in order that 116 was reached leaving Jack Ford on 0 no. Aaron Hastie and Ben Seaman opened the bowling and immediately pegged the opposition back to less than two an over in the first six with a tight line and accurate length. Importantly Ben poached two caught and bowleds which left Filleigh with a tough run chase. With Tom Shovelton keeping tidily behind the stumps, Joseph Stevens and Jack Ford kept the bowling miserly picking up another wicket along the way. An inevitable middle order resurgence briefly pushed the run rate along but with unflinching attention to line and length, Will Lamana, James Seaman and Rose Ball ensured that Bideford would cross the line as winners on the day. To cap the day, An amazing catch at first slip from Aaron Hastie gave Olly a wicket and Filleigh fell some 26 runs short. As a result, Bideford Under 12s won the league - well done the team ...! Following on from the previous week's success at Chulmleigh the Bideford Under 12s travelled to Braunton in their latest league encounter. Batting first, Bideford opened up with Olly Hannam (25) and Matt Parkhouse; Matt fell early to a good length ball that kept low which brought skipper Karne Elphick to the crease. The pair started with caution against some tight Braunton bowling and gradually eased the score up to 4 an over. Karne's LBW broughtvRose Ball (30 rtd) to join Olly and she began in positive form with some good early strokes. Together the pair pushed up the run rate before Olly uncharacteristically hit a full toss to mid wicket to end his great knock. Rose carried on with James Seaman (14no) before having to retire after a super 30. James continued his good form from the previous week with some lusty hits and formed some useful partnerships with Joseph Stevens, Aaron Hastie and Thomas Shovelton. At the end of the innings Bideford had managed a great total of 140 from their 20 overs. Opening up with the youngest members of the team, Ben Seaman and Dan Bailey kept the Braunton openers quiet before Ben snaffled a leg before to start the demise of the Braunton innings. All Bideford bowlers were on form today, with Sam Pyle picking up a couple of wickets and some super efforts from Aaron, Joseph, Matt and James. Fielding was good with a smart one handed catch from Olly at short cover, a run out by Ben and with a solid display by Thomas behind the stumps. Steady pressure led the opposition to fall some 46 runs short with their last pair at the wicket. Once again a good effort from the Westward Ho! boys. On a glorious Sunday morning (14 July), with the sun riding higher by the hour and the temperature soon nudging 26 degrees, a Bideford Under 12 side set out for Chulmleigh in their latest league encounter. Having been inserted by the opposition, openers Thomas Shovelton (20) and Jack Ford (4) saw off the new ball bowlers and made a steady start. Falling to a good low catch from a clip to square leg, Jack's departure brought skipper Karne (13) to the crease. Some strong strokeplay and good running with Thomas pushed the total along before Karne left too much leg stump exposed to be hit by the bowler. James Seaman strode to the crease at number 4 and announced his early intentions with a great 6 behind square which soared over the fence with space to spare. Spurred on by successful hits, James accelerated to a season's best 24 in good partnerships with Thomas and then Aaron Hastie (13) before being retired. Joseph (0) was unlucky to fall to a catch early on before Matt Parkhouse came in with only two overs to go and walloped the ball with some great cricket shots to all corners in a quick fire 23 with one six and four fours. A grand total of 127 was likely to be a challenge for the home side. With George Smale keeping wicket well, Bideford opened up with Will Lamana down the slope and Ben Seaman at the other end. Will took a wicket in his second over and Ben followed with two more to leave the hosts three down for only 12 runs. Jenny Smale came on to bowl two tidy overs and nearly claimed a wicket by a close catch from George behind the stumps which only just fell to ground. Joseph bowled a great spell to record 2-0-4-2 whilst Aaron bowled a great miserly two overs of spin for only three runs. Matt and Karne bowled four good overs for little reward as Chulmleigh set about repairing the early damage. Jack took the gloves to let George have a couple of overs and Thomas followed his great innings with a wicket in his only over. Will and Ben finished where they started with Ben snaffling a clean bowled, a LBW and then a sharp stumping by Jack to finish with figures of 3-0-8-5. (The Chulmleigh umpire kindly presented the ball for Ben to keep!) A great effort and it was nice to see that the Chulmleigh umpire remarked how well the side played and supported each other in the field as a team. Chulmleigh fell some 47 runs short and all players were glad to grab a drink and a cool down after an enjoyable but very hot match. Well done the Ho!